a trip to the farmers market yielded these beauties. 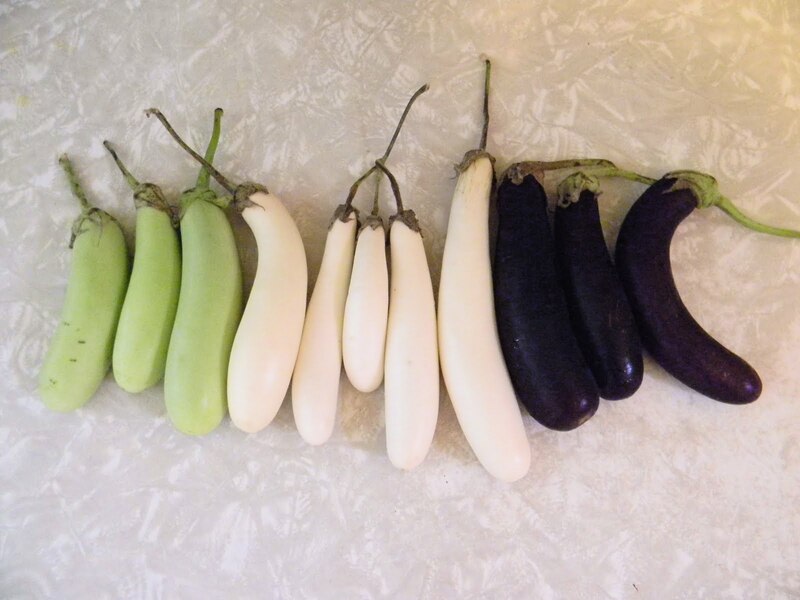 i love tiny eggplants-they are so tender and mild in flavor compared to the big ones. 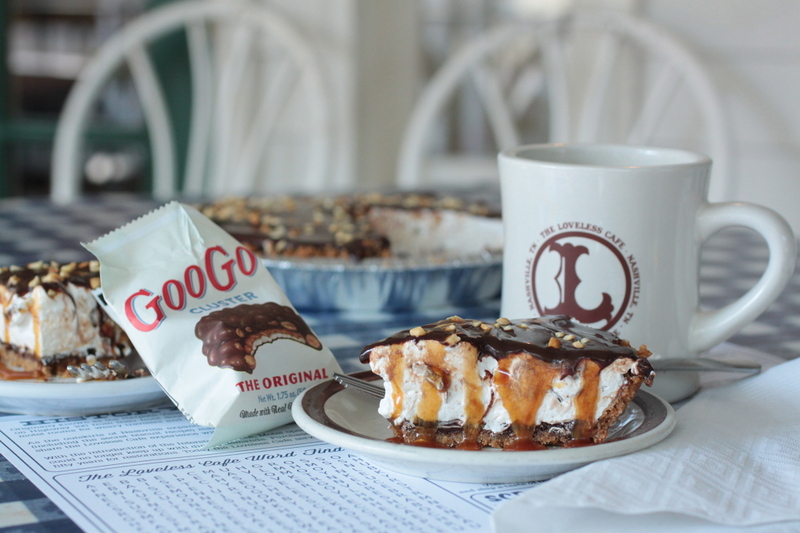 we grilled some and the rest became the inspiration for this pie. traditionally, moussaka is made with ground meat but in my attempt to cook more vegetarian meals, i chose to substitute some wheat bulgur. to increase the flavor of the filling, i cooked the bulgur in vegetable stock. 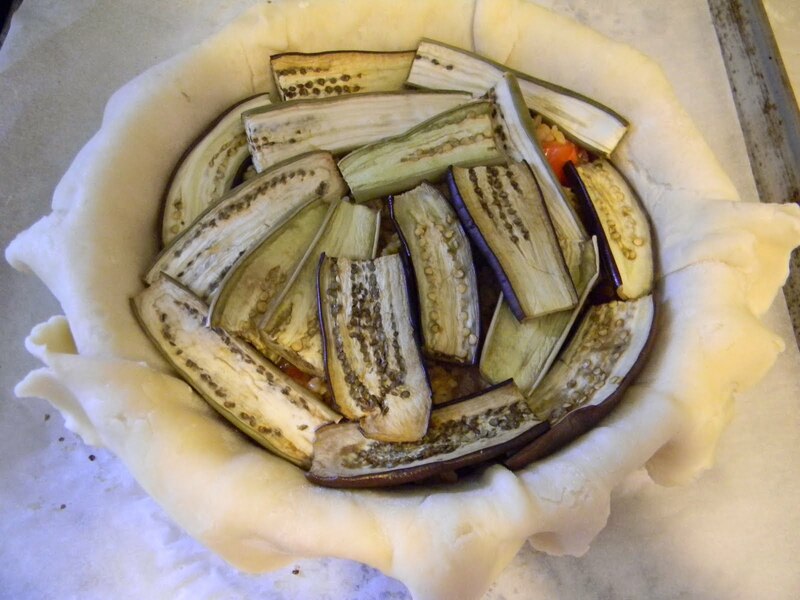 i roasted slices of the eggplant in the oven and this both softened them and eliminated some of the juices that may have made the filling soggy. 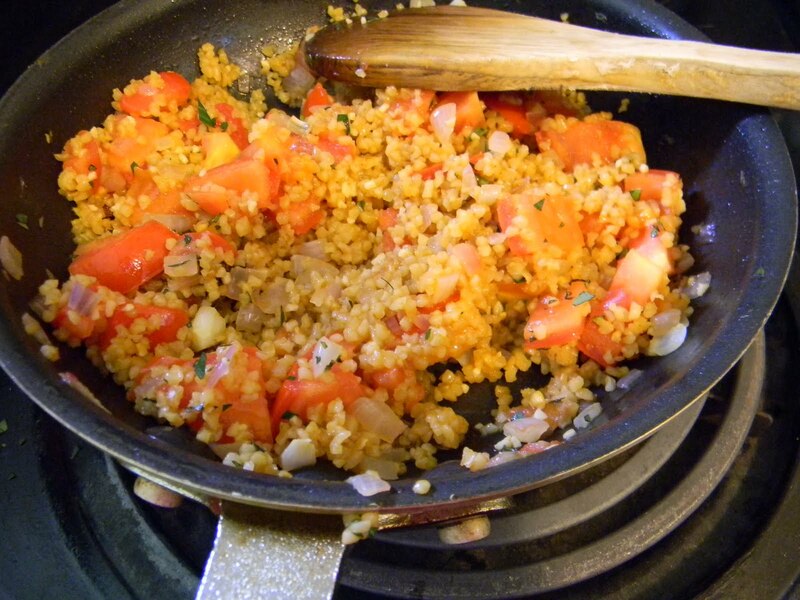 the bulgur was sauteed with onions, garlic and herbs from the garden to make a flavorful substitution to meat. i layered it all in a 4 cup casserole dish which was lined with some homemade pie dough that was mixed up using an expeller pressed non-hydrogenated vegetable fat-great for my low cholesterol diet. 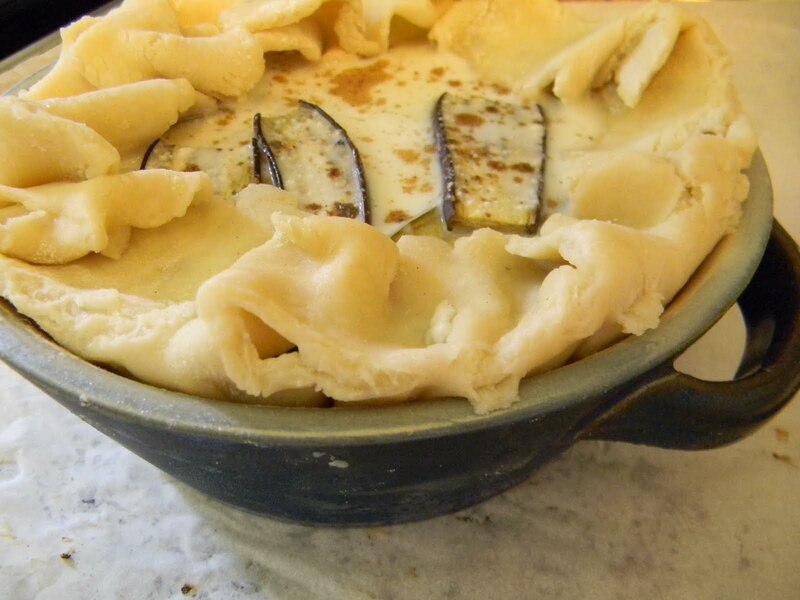 a thin custard of ricotta cheese and egg whites (a lighter version of the traditional bechamel sauce) was poured over the filling. 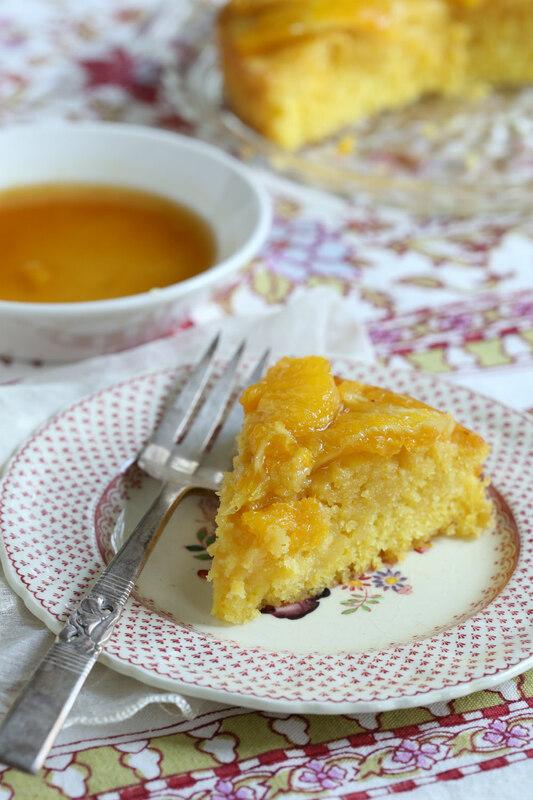 fresh from the oven, it was a filling meal that we didn’t feel guilty for eating-chock full of whole grain and veggies and a lowfat custard made it a good choice for my low cholesterol diet. 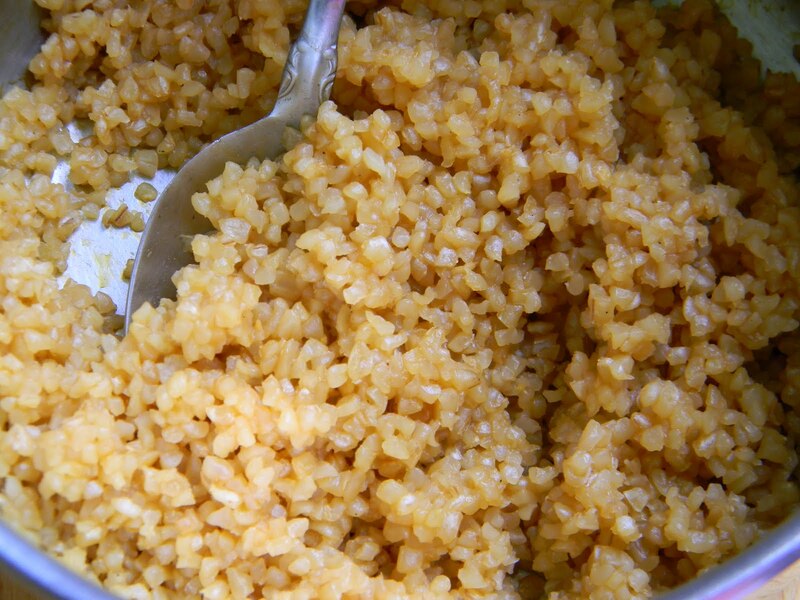 preheat the oven to 350. cook the bulgur according to the directions on the package using vegetable broth or water. 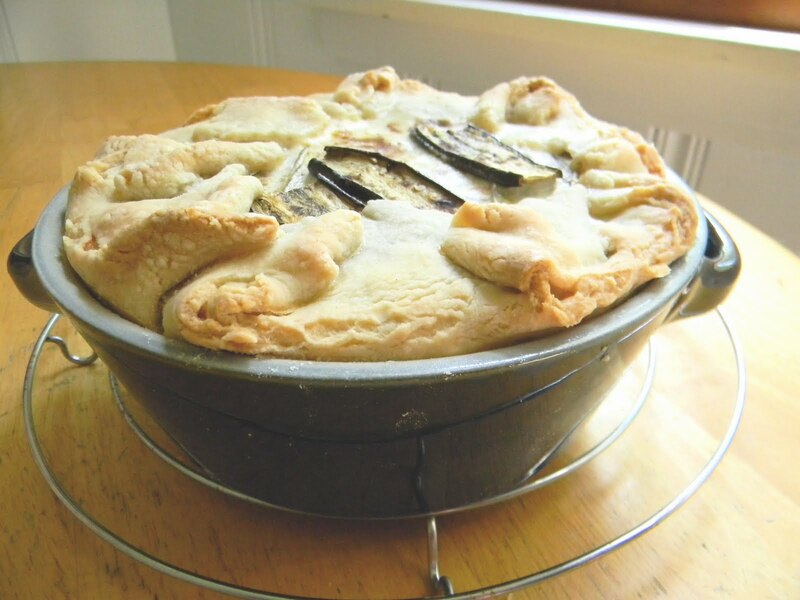 slice the eggplants into 1/4″ slabs and lay them on a sheet pan lined with parchment paper. bake the slices until they soften and dry a bit-10-15 minutes. remove them from the oven and set aside. in a saute pan, heat the olive oil and saute the onions until soft, add the garlic and oregano and continue to saute for another minute. add the tomatoes and season with salt and pepper then set this aside as well. in a mixing bowl, mix the ricotta with the egg whites and whisk until smooth. add the milk, cinnamon and allspice and whisk to combine. line a 4 cup casserole with the pie dough allowing the excess to hang over the outside. 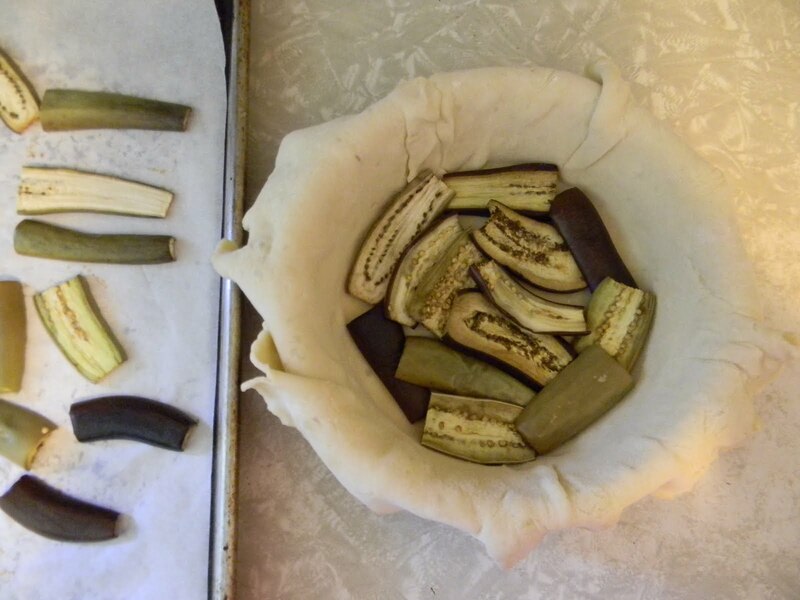 lay half of the eggplant slices over the bottom of the dish. 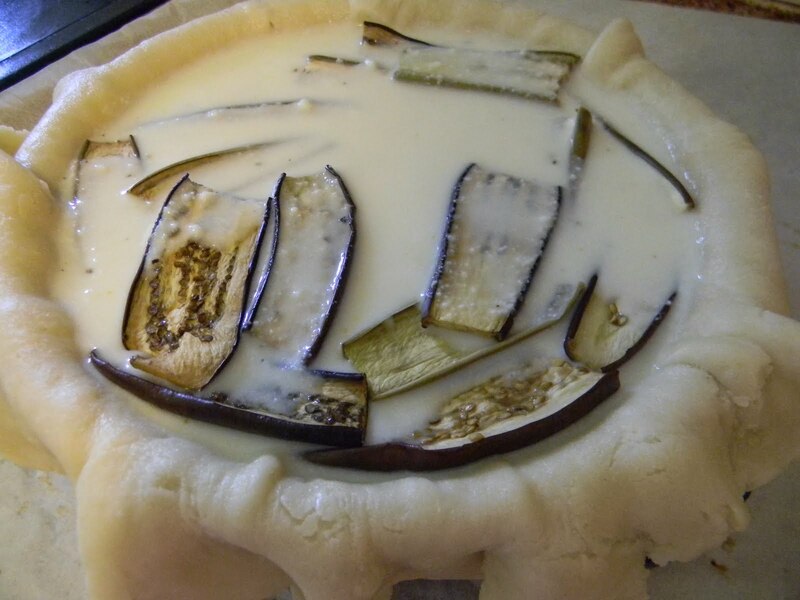 top this with the bulgur mix and cover the filling with the remaining eggplant slices. whisk the custard and pour it over the filling in the dish. 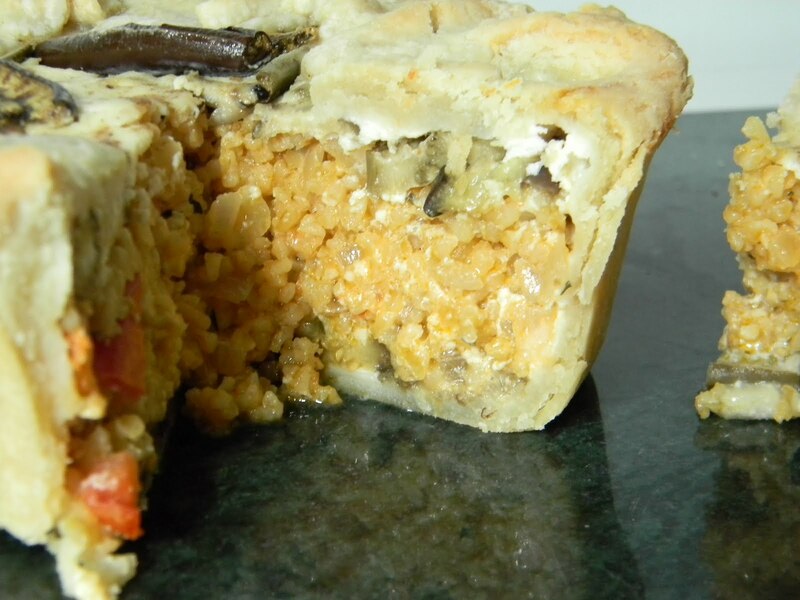 carefully lay the excess crust over the filling so that most of the filling is covered. bake until golden brown and the custard is set, about 50 minutes. let it rest on the counter for 15 minutes or so before serving. a green salad completes the meal! 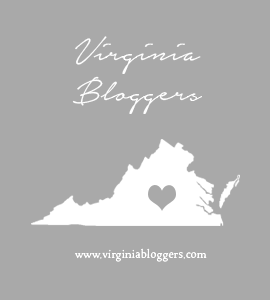 need a recipe for pie dough? try this one from pie #18. and as always, bake one and send me a photo-i will post it here!